New variety of satsumas for Louisiana. This tree was designated a Texas Superstar in 2010. Cold tolerant to 14 degrees. -All my 5 gallon trees are 1 year old at this time. Because of the ongoing bug infestation of Floria Citrus trees, my grower has taken additional steps to insure the high quality of all his Citrus Trees. All trees are now certified to be Asian Citrus Psyllid insect free!! We are trying to keep the citrus insects under control here in Louisiana. 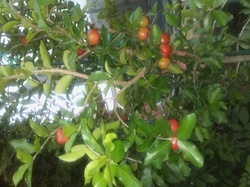 I keep a large variety of citrus trees at my location in the New Orleans area. Satsuma--Owari, Brown Select, and MIHO Satsumas. MIHO can grown anywhere in the state of Louisiana up to Southern Arkansas. 14 degree tree. Also Persimmons, Pomegranates, Loquats, Chinese Chestnuts. All varieties are available in 5 gallon containers for $40.00. These trees are 1 to 1 1/2 years old and will produce some fruit next season. Keep in mind that first and second year citrus fruit can be poor quality and should be cut off. Copy and paste link for gift card infomation. Most of my trees sell for $40. A Calamondin is a cross between a kumquat and orange or kumquat and mandarin. It makes a very nice houseplant. The plant height can be controlled by the pot size and pruning. It will grow larger in the ground. Cold resistant 25 degrees. It is quite showy and fragrant when the fruit and blossoms kick in. Blooms and produces fruit all year long. The fruit is orange/red about golf ball size. It taste like a lime with a hint of mandarin. The rind is edible and sweet to taste. The fruit is juicy with high acidity. The fruit makes an excellent marmalade. It also stops insect bite itches. The fruit can be frozen whole and used as ice cubes in summer drinks. The plant is rather cylindrical and erect with dense branches and will grow in a variety of soils. Location: Make sure your plants receive five to six hours of sunlight. Set your tree in a southern exposure, if possible, or supplement the light by using 40 watt fluorescent shop lights above the plants. Fertilizer: Use an acidic fertilizer during the plant's active growing season in late winter, June and August. Use a high-nitrogen-low phosphorus food (20-10- 10) or one specifically for citrus every time you water. Water: Your pot must have good drainage as you water every few days. Mist the leaves and give your tree a shower occasionally. Humidity: Homes in winter have drier air, so try a tray of pebbles under the pot. All my trees are 3 to 5 feet tall. I'm located at 2032 Pasadena Avenue, Metairie, Louisiana. Citrus information is available from the LSU website.